ICUS Planning Board members listen to a presentation. 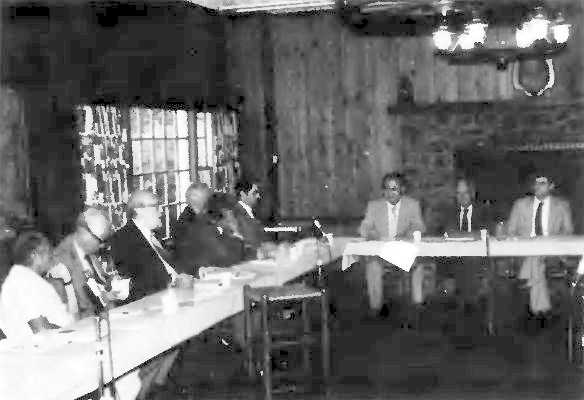 The planning board of the International Conference on the Unity of the Sciences (ICUS) met for the very first time on May 31 to June 2, 1985. This new board, consisting of a dozen long-time ICUS participants and one or two members of the ICUS secretariat, is designed to clarify and renew the internal focus and direction of ICUS, as well as to upgrade its administrative organization. As a recommending body, it will work to articulate the fundamental vision of ICUS, and offer suggestions to the ICF Board of Directors concerning practical implementation of the ICUS goals and themes: "Unity of Knowledge" and "Science and Values." In this framework the ICUS Planning Board will pursue manifold external as well as internal tasks. Externally, the Board hopes to create greater continuity from one year to the next, so that logically related conference themes and consistent conference programming can be developed in detail for each ICUS annual meeting. It is also important for ICUS to implement more long-range planning. Scheduling conferences two, three, or even five years in advance will enable participants to plan ahead and to prepare high-quality research papers. Further, ICUS has reached a point in its growth as an organization where it needs to stabilize itself as an enduring institution. A Planning Board will provide a managerial group with its own system of checks and balances, so that ICUS will not have to depend on just one or a few individuals for the fulfillment of critical responsibilities. It is the hope of the ICF Board of Directors that the Planning Board will help the ICUS operation become more sophisticated and professional overall. 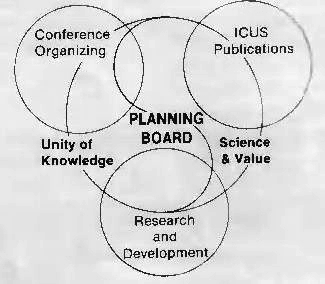 The idea for the ICUS Planning Board grew out of a meeting called in October 1983, a month before ICUS XII. There, Dr. Kenneth Mellanby, Neil Salonen, Glenn Strait, James Baughman, and fifteen scholars recognized the need for a more permanent, long-term, planning body as they were organizing ICUS more than one year in advance. The suggested "ICUS Planning Board" would be composed of between 15 and 20 scholars, plus one or two members of the ICUS secretariat. The Board was conceived as a semi-permanent body with rotating membership, which would accommodate constructive change as well as continuity. Rev. 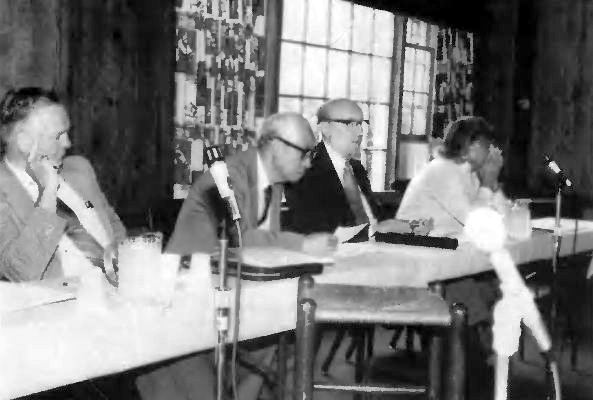 Kwak addresses the ICUS Planning Board on May 31, 1985. The first Planning Board meeting was conducted over a three-day period. "The purpose of the first day was to focus on the vision of Rev. Moon," explained James Baughman, executive director of ICUS. In a short presentation, Baughman demonstrated how the basic ICUS themes -- the unity of knowledge, the interrelationship between science and values, and the emerging global cultural renaissance -- have their roots in the theological teachings of Rev. Moon. Since God is the source of all truth, and existence is essentially relational, a fundamental unity of knowledge must be possible. Likewise, the fulfillment of relationships is the essence of true value, with those based upon unconditional love of supreme or absolute value. "Rev. Moon believes in the potential of these ICUS scholars and scientists," said Baughman. "Their lifetime activity is the search for the truth about our ultimate origin and destiny; they are always on the cutting edge of new ideas. While their efforts can reveal how our universe works, Rev. Moon also wants them to remember why they are doing what they are doing. The purpose and value of their work lies in the making of a more ideal world." Through ICUS, Rev. Moon's specific purpose is to create an organization that can relate to the real concerns of scholars and scientists and provide them with an opportunity to contribute to the substantial building of the Kingdom of Heaven on earth. It is because of his love, and his faith and hope in the creative efforts of scholars and scientists, that such great efforts are made on their behalf through ICUS. ICUS Planning Board with three regular committees. On the second day, the Planning Board discussed the creation of three working committees. The first will deal with conference organizing; it will be responsible for evaluating the content and format of the annual ICUS meetings in order to determine whether they effectively accomplish ICUS goals. A second committee will concern itself with ICUS publications; it will strive to set up a viable in-house publications network to serve its attending scholars and evaluate possible new publications vehicles. A third committee will focus on research and development; it will investigate new conference topics, seek out new conference participants, research outside journals willing to publish conference papers, and even find possible funding sources to supplement the financial needs of ICUS. The Board devoted the third and final day to the planning of the 1986 ICUS. Unlike other, usually high-powered, professional ICUS meetings, this meeting was informal, held in the retreat environment of Airlie Lodge in Virginia, where everyone could relax, take time to reflect, and learn about each other. Bonds of understanding and friendship formed and deepened. In general the participants were both serious and elated. One professor remarked that the experience had sobered him, as he had never before adequately realized the dimension and importance of ICUS; he expressed appreciation of Rev. Moon's vision. Baughman concluded, "The realization emerged from this meeting that while ICUS is inviting participants to investigate Rev. Moon's vision -- the possibility of unifying knowledge and applying it in a valuable way to transform our world -- it does not set out to prove or validate Unification theology. There is a subtle but important difference here. The task of the Planning Board is to evaluate the ICUS goals and to determine how they can best be achieved, something which has not yet been professionally done. This first ICUS Planning Board meeting has empowered ICUS to work on a new level."